On Friday April 5th, 26 utility poles fell on East Marginal Way in South Tukwila around 3:50pm. One Seattle couple is thankful to survive after one of the poles smashed through the windshield of their car trapping them inside. Luckily, the couple, Tom and Linda Cook, only suffered minor cuts and bruises. According to an article by the Seattle Times, Tom Cook attempted to exit his car when a bystander shouted out for him to stop because of the live electrical wires that were strewn across the road. This advice may have saved Tom Cook’s life. Even if he did not directly touch a live wire, the ground around the wire may have been energized up to thirty-five feet. Instead of leaving his car and risking electrocution, Tom Cook and his wife waited for over an hour while emergency crews turned off the power and safely extracted them from their car. Seattle City Light does not know what caused the poles to fall. Often power lines are brought down either to do a sudden event, like a lightning strike or strong gust of wind, or deterioration of the pole over time. Here, the weather does not appear to have caused the incident. According to the National Weather Service in Seattle, there were no lightning strikes hitting the poles. There were gusts of wind between 20 and 30 mph that day, but nothing out of the ordinary for the area. It is possible that deterioration played a role. The Puget Sound is classified as a “high deterioration zone” by the American Wood Pole Council due to the coastal climate. Seattle City Light reported that the poles along East Marginal Way were inspected in 2016 by a third party vendor. During the inspection, none of the poles were identified as posing a public safety hazard of being in immediate need of replacement. Seattle City Light is having a third party investigate the cause of the incident. The investigation will include a review of past inspections, inspection of the damaged poles, and a review of available video from the area. There is no estimate for how long the investigation will take and when answers will be available. 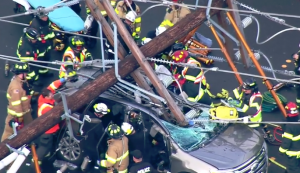 If your car is hit by a utility pole while driving, you should act just as Tim and Linda Cook and wait in the car until emergency crews arrive to deactivate the powerlines and safely remove you from the area. While waiting inside the car, be careful not to touch the frame of your car because it could be charged with electrical current. If you see bystanders approaching your car, you should call out and warn them stay away until emergency crews arrive. If your car is on fire, you should jump from your vehicle and shuffle away from the scene with both your feet on the ground. In the event that you or a loved one has suffered an injury from a downed power line, call the experienced personal injury attorneys at Kraft Davies.